The median annual retainer given to directors increased for the fifth consecutive year, reaching $250,000 in 2017. Directors’ median annual retainer increased for the fifth consecutive year, topping out at $250,000 in 2017, according to the new Equilar Director Pay Trends report. The study, conducted from 2013 to 2017, found median annual retainers increased by $35,000 (16.3%). Those in board leadership positions received a larger average increase in their retainers. For example, the median retainers for non-executive chairs and lead directors in 2017 rose to $421,000 and $290,000, respectively, a 10.8% and 18.4% increase from 2017. Almost all (over 98%) of the Equilar 500 companies included at least some portion of cash in the median annual retainer in 2017, while 7% of companies used options. This lack of option prevalence falls in line with the compensation trends observed for executives, as companies have continued to distance themselves from stock options. Annual retainers are up, but the same can’t be said for meeting fees. Only 10.6% of companies awarded meeting fees in 2017, a 59.1% decrease from five years prior. When these fees were prevalent, a majority fell within the $1,000 to $2,000 per meeting range. Only 5.7% of meeting fees had a value exceeding that of $3,000 per meeting. 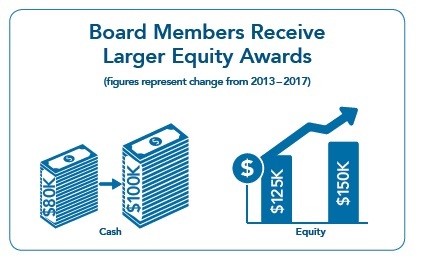 In contrast to disappearing meeting fees, more issuers are rewarding board members for sitting on certain committees. Audit committee members most often received retainer premiums. The percentage of Equilar 500 companies that granted retainers to audit committee members in 2017 rose to 47%, an increase of 9.8% over 2013. That was a substantially higher portion than those granting retainers to compensation or governance committee members in 2017, at 33.5% and 32.4%, respectively. Being on the audit committee also pays higher, on average. The median audit committee retainer rose to $14,000 in 2017, which is $4,000 higher than the median pay for other committees and a 40% increase from 2014. The Equilar 500 are the largest, by reported revenue, U.S.-headquartered companies trading on one of the major U.S. stock exchanges (NYSE, Nasdaq or NYSE MKT [formerly AMEX]), adjusted to approximate the industry sector mix of similar large-cap indices. Fiscal years are defined by proxy filings between July 1st and June 30th. Poor use of shareholder monies based on recent activities. Pay should be performance based.